In the previous post on this subject I explained how the term “competitive advantage” has been diluted in many ways both by entrepreneurs and by innovation teams at established corporations. I listed the six types of competitive advantage I have both studied and worked with in practice. In the previous post I described the first three of these advantages. In this post I will describe how the last three can protect or grow your business. Economies of scale: This type of competitive advantage is created when the players in the industry only can achieve profit after passing considerably high production volumes. However, when production volumes grow beyond a critical volume, the profits per unit sold increase dramatically, often exponentially. Indeed, the massive scale and installed base that some players in certain industries enjoy have given them an advantage that goes beyond production: It spills over to marketing, distribution, purchasing power vs. suppliers, R&I etc. This not only applies to physical product like mobile phones, digital cameras or, maybe the best example, mainstream automobiles. It also applies merciless to retail (like Walmart), consumer goods, telecom operators and pure internet players. Telecom operators are indeed absolutely dependent on achieving a massive critical number of customers in order to deliver a profit out of ever cheaper communication prices. On the other hand, internet-heroes like Spotify and Uber are still bleeding money. Why? Among other factors, because they still haven’t achieved big enough international scale and number of paying customers to cover their investments and operations. Economies of scale are an extremely powerful entry barrier against newcomers and they are specially effective when the company pursuits a strategy of organic innovation. However, companies making use of or planning to achieve this kind of competitive advantage must be wary. First of all, it is extremely capital-intensive and can make the corporation very vulnerable to macroeconomic downturns, when sales may diminish dramatically. Those are the typical occasions when a wave of consolidation usually reduce the number of players even more and make them even more dominating. 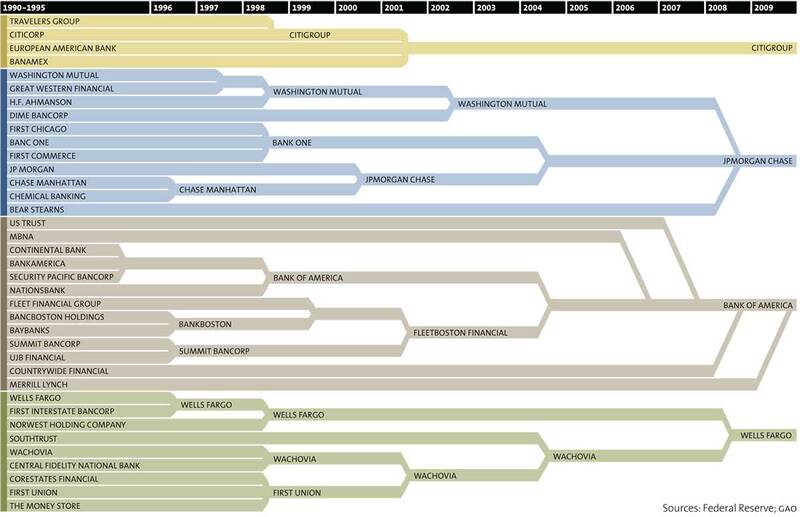 After the financial crises in 2008, the few “too big to fail” banks have become even fewer and even bigger. Secondly, economies of scale imply a large balance sheet and massive investments and installed base. They usually imply rigid processes and business models. Therefore, a disrupting technology or a new player exhibiting a more nimble and effective business model can rapidly destroy them. The tragedy of Nokia or the struggles of Walmart against Amazon are good examples of this. A company or startup pursuing economies of scale should make sure that either their operations and business model are resilient to technological changes or dare to lead them. Economies of scope arise when the value of the products and services it sells increases in function of the number of business that the firm operates in. It is often associated to the same companies that make use of economies of scale. The main economies of scope are operational and financial. Operational: This is the case when different business units of the same company share activities -like R&I – or when the competencies from a particular business unit can be transferred to another. For instance, a single sales force can be used by the parent company to sell several brands to the same client. The same sale agents can “bundle” products and services together and achieve status of “single point of contact” for the customers, thus reducing their search and transaction costs. Telecom companies have done this for decades, combining TV, telephony and data access as an integrated offer to their customers. Financial: This type of economy of scope arise when capital can be allocated among business units across the company for the purpose of financial or taxation efficiency (read “pay less taxes”). Some companies buy other firms in financial distress in order to profit from tax reductions due to the accumulated losses of the acquisition target. When I worked as an Investment manager at Telenor New Business, it happened that entrepreneurs with failed startups came to us with the purpose of being acquired. Their argument towards Telenor was precisely their accumulated losses and the tax efficiency that those could mean for Telenor. In my opinion, Facebook has mastered economies of scope like few other technology companies have. The social giant has seemingly done everything right. It has several services – messenger, Facebook, whatApp, instagram etc. Their users flow from one service to another thanks to the fact that those services are de facto “bundled”, consuming advertising in the process. At the same time, the core operations infrastructure (sales, servers, data rooms, analytics…) is common for all of those services. Is your new corporate venture capable of creating economies of scope? How could the new services be bundled with current ones? Will other business units acknowledge the value increase that the new venture represents for them or will they just ignore it and kill it in silence? Which incentives will you use in order to avoid such fate? Regulatory influence (or lobbying): Technology giants like Google, Microsoft and Apple dedicate huge amounts of money to lobby for their own interests vs. regulatory agencies. Telecom operators have lobbied (and still do) protecting their interests through organizations like ETNO (European Telecommunications Network Operators). Microsoft fought many years against making office documents compatible across productivity programs. Each fiscal year that compatibility was avoided, the shareholders of Microsoft were rewarded with billions from the MS Office cash cow. The dominant manufacturers of electromechanical contactors have avoided the introduction of cheaper, electronic ones in Europe thanks to their influence on European standards. Is your company present in the right lobbying organizations? If you are a startup or small entreprise, are your much bigger partners doing it? What are those partners lobbying for? Are you at least following the standards and regulatory frameworks that may transform your competitive landscape? Either you are an established company, a new venture inside a parent corporation or a startup, to chose a competitive advantage is crucial. In a world subject to permanent changes, it is the responsibility of the management to develop the right resources and skills to build, change, and defend them.